Why isn’t Amtrak on the table? After completing all of my Christmas shopping online this year, I used the saved time to finally get a chance to read a very well researched paper released a few weeks ago on the privatization of Amtrak written by Oregon’s own Randal O’Toole. Isn’t it great and indeed fitting that the world’s greatest transportation analyst resides in our own state? This paper is very timely, because domestic discretionary spending needs to be cut deeply and with bipartisan enthusiasm if Democrats refuse to cut entitlement spending and Republicans refuse to cut defense. The most interesting dynamic in these budget negotiations is how little in taxes Obama is actually pushing for given the paltry cuts he is willing to accept. Letting the Bush tax cuts on the highest marginal bracket expire is politically popular, but it just doesn’t raise very much money, even by the methodologically optimistic calculation of the OMB that is prevented from using established economic science for dynamic scoring, a body of evidence that comes not from Republican hacks, but from the peer reviewed research of UC Berkeley’s David and Christina Romer. We have a spending problem not a revenue problem. Republicans love to point out that the debt Obama has accumulated exceeds the sum of all the debt from every previous administration before him. This is true, but what gets left out of that narrative is that most of our spending has been the result of legislation George W. Bush very happily signed into law. When it comes to the deficit however, it was not Bush’s 2001 tax cut that blew a hole in our budgets; it was his runaway spending. Revenue during the Bush years was rather stable. Like Obama, Bush inherited a recession, but by the end of his first term, federal tax receipts returned to the levels seen during the fat boom years of Clinton administration surpluses when taxes were slightly higher. 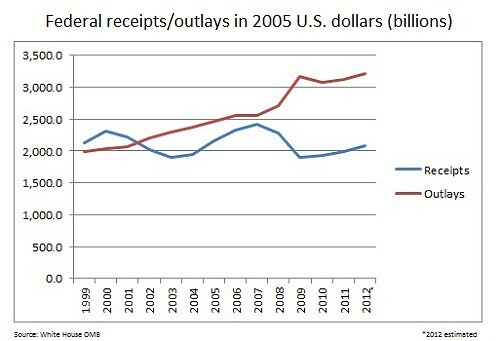 Though signed into law in 2001, the lion share of Bush’s tax cuts did not go into effect until 2003. By 2005 the IRS was partying like it was 1999. A year later the Bush administration was taking in more revenue than his predecessor did but doing it with lower marginal rates, that is a fact. Wouldn’t it be nice if there were some low hanging budgetary fruit to cut spending? O’Toole argues persuasively that the red ink from public ownership of Amtrak should be easy pickings. Anyone who knows O’Toole’s work would understand that his paper is too packed with details for me to fully summarize it here. I strongly urge you read it in its entirety here. Of course it will take a lot more pieces of fruit than just Amtrak to make up for the leadership of the two parties’ unwillingness to make real cuts in the areas where the big money is. The fact that Amtrak and the many other wasteful programs that make up our domestic discretionary spending have not been on the table serves as a symbol as to why we will always have a spending problem no matter how much revenue the US Treasury takes in.